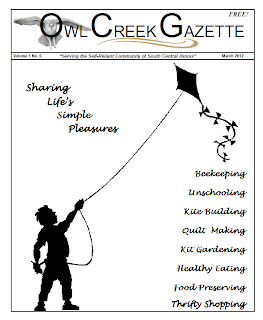 Owl Creek Gazette: Missed reading the March 2012 issue of the Owl Creek Gazette? Missed reading the March 2012 issue of the Owl Creek Gazette? No problem ...you'll find the complete magazine online via our Archived Issue page! We truly appreciate hearing from our readers and are pleased to include their kind letters each month via our "In Our Readers Own Words" page in the magazine. courtesy of the shows co-hosts Dennis Kelly and Joy Tsakanikas and their listeners. family routine. We have especially had a lot of messy fun making the seed packets from the January issue. Please send the Owl Creek Gazette our blessings. your radio program as well.